Roll casting - learn to roll cast. Roll casts use a different form of back cast, its not a back cast at all, it is a circular motion cast that changes the direction of the line. 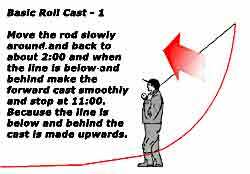 Instead of being a straight line roll casts use a tensioned curved loop of line called the “D loop” and the three casting rules of course apply. Don't stop the rod on roll casts because the line will fall and the tension will be lost and the cast will fail. Roll casts include the Spey and Underhand casting techniques and are very important methods especially for river and salmon anglers using two handed rods. Roll casts depend on the back cast forming a smooth curved loop, the line having minimal contact with the water whilst the remainder of the loop is perfectly formed in mid air, allowing the power stroke to be delivered with maximum efficiency, at the instant of water contact. During the roll cast, the rod does not stop, it changes direction and speed, being loaded at all times. Consequently the tip of the rod "turns" as the cast is made and the "D" loop is formed. There should be no slack in the loop when the forward cast is made.Simple roll casts can be made with a stationary loop of line drooping to the water surface from the rod tip, a valuable method of casting a short distance or straightening line in preparation for a longer cast. to ensure success. Single handed roll casts depend almost entirely on fast, snappy wrist action, the exact opposite of the best practice for straight line casts. The "D" loop is formed by first elevating the rod to 1100 tilted at a suitable angle away from the body, with the arm somewhat extended. The arm is then drawn back towards the body by compressing the bicept muscles and, simultaneously, the rod is swept backwards to 1400 by the wrist opening and turning in a loop, into position for the acceleration into the power stroke. This pear shaped loop described by the tip of the rod is what constructs the "D" loop and by stopping the rearward motion of the line it allows the leader and the tip of the line to alight on the surface to provide the anchor for the power stroke. If the line is not anchored, the energy from the power stroke will be discharged immediately and instead of the line being propelled forwards, the fly will whiplash violently, endangering the angler. If the cast is only slightly mistimed the whiplash may not be serious but it will be audible and it is a signal to hesitate slightly to ensure that the "D" loop is correctly formed before completion of the cast. A well executed roll cast sends the line high, straight and true away from the angler, similar to the delivery of the overhead cast. If there is too much of an anchor i.e. water contact is excessive, the line will fail to lift cleanly from the surface and the cast will fail. Care has to be taken with sinking lines, they can be allowed to rest for only the minimum of time because if they submerge, it is difficult to get enough energy into to power stroke to lift them and complete the cast. If this occurs the line must be rolled onto the surface and the cast repeated immediately, before it has a chance to sink again. It may be necessary to reduce the amount of line out to do this.Single handed roll casts can be made from both forehand and backhand, in order to cope with obstacles or the wind. For maximum efficiency the angle between the "D" loop and the forward cast should be small (as near a straight line as possible). Thus it is better to align the "D" loop with the direction of the forward cast before making the roll cast. One final adaptation of the roll cast is the "Roll Lift". In this case the roll cast is used as a means of lifting a dead line from the water to make a straight line false cast. To perform it correctly the line must be hit even higher and harder than normal to ensure that line is straight and that the fly does not kiss the water when the straight line back cast commences. It is a very useful cast because it prevents disturbance close to the angler. Roll casting methods benefit greatly from hauling techniques also and this is described later. Roll casts use the principle of a D loop whereby a D shaped loop of line is anchored by water contact allowing the power stroke to deliver sufficient energy to the closed loop to extend the line (unroll it) in a controlled manner to complete the cast. Because the D loop does not need much space behind the angler, roll casts are ideal for fishing in confined spaces, where for instance, there are bushes or trees behind. The mechanics of each method are based upon sufficient energy being applied to a length of line behind the rod to propel it beyond the rod during the forward cast. Every cast is dependant upon a good back cast, whether it be a straight line or a D loop.